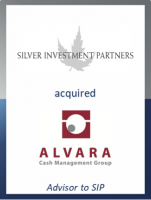 GCA Altium acted as exclusive financial advisor to Silver Investment Partners ("SIP") on the majority acquisition of ALVARA Cash Management Group, a leading secure cash cycle software vendor. This transaction once more underpins GCA Altium's strong expertise in the FinTech Software space. ALVARA Cash Management Group is a leading European provider of cloud-based software solutions to control, automate and monitor the entire cash cycle – from the point-of-sale checkout counter to the cash-in-transit company and the responsible bank, right back to the ATM. ALVARA serves all parties involved in payment transactions and the physical cash cycle from a single source and has a diversified customer base. Retailers such as REWE and cash-in-transit companies such as SecurePost in Switzerland represent the largest customer groups. With this transaction, ALVARA lays the foundation for the development of an orderly management succession plan. In addition to SIP, the second management level will also acquire a minority stake as part of the takeover. The former majority shareholder and founder of ALVARA, Bernd Hohlfeld, also retains a minority stake in the company and, in the medium term, will continue to be responsible for the operative business as a board member. SIP is an independent equity investor for medium-sized companies in Germany, Austria and Switzerland. An entrepreneurial, experienced and trusted partner, SIP engages in majority and minority interests in companies with revenues of between EUR 5m and EUR 100m. SIP will support ALVARA as strategic sparring partner in its future development through organic growth and selective acquisitions in the industry.